This is a loving dedication to my two 5 year old (almost 6) GSD's Bonnie and Clyde. They had a love affair from the moment we put them together as puppies. Bonnie adored Clyde and made sure to give him kisses every day and Clyde was her protector, even almost dying after he protected her from a stray dog that came into our farm and viciously attacked him. They survived that and together they created the most beautiful and sweet puppies in the world, a total of 15 that went to loving homes all around Miami. The puppies became the spitting image of their parents both in looks and personality. Our hearts were broken in January when Bonnie took a sudden turn for the worst and woke up feeling sickly and down. After a routine surgery found her ridden with cancer, we lost her to the disease. Clyde was definitely lonely without her but we made sure to shower him with love and attention. My brother made sure he slept in his bed every night and treated him like a little brother. He couldn't wait to be by our side every night or to go for a walk or run through the yard on weekends. Just 4 short months later, I came home from work late at night to let Clyde out of the side yard and immediately saw that he had bloat. I was devastated,knowing that this condition was usually fatal. We rushed him to the vet and sweet, sweet Clyde, though down, never lost the warmth or kindness is his big, indian-brown puppy eyes. The vet took him in for e-surgery and was hopeful but we were shattered when we received the 1am call that he had not survived the surgery. Bonnie and Clyde were unlike any dogs I have ever known...they had immense personality and their goal in life was to exhibit love and be cuddled in return. They were so grateful of our love and attention and it breaks my heart to know that we could have always given them more of us since they gave us 200% ALWAYS. 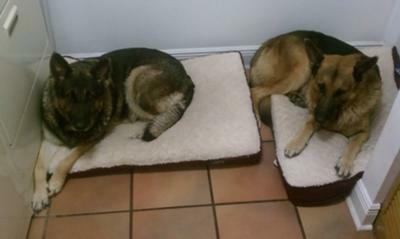 Not only you had double the joy but you also have double the sorrow on both you beloved Shepherds, Bonnie and Clyde. They are together. Losing a beloved companion is so hard and the grief is unbearable but your Heart might be big enough one day to get another angel, by no means to replace, that could never happen but your Heart will heal and the sorrow will fade. Dogs make are lives whole. God Bless Bonnie and Clyde they will live in your Hearts forever. Thank you for sharing your story! Hugs to you! R. I. P. Bonnie , and Clyde!